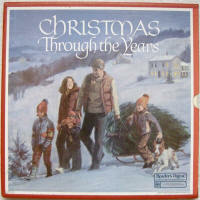 Readers Digest Christmas Album "Christmas Through the Years"
Produced by RCA records, catalog #RDA 143a released 1984. Features recordings from the 1940s with Perry Como, Glenn Miller, and Bing Crosby to the modern pop era with Brenda Lee, Roy Orbison and the Lettermen. 2- Have Yourself a Merry Little Christmas - Perry Como. 4- Christmas Eve in My Home Town - Kate Smith. 5- Silver Bells - Perry Como. 4- The Christmas song (Chestnuts Roasting on an Open Fire) Perry Como. 4-Christmas in Killarney - Dennis Day. 2-Here Comes Santa Claus - Eddie Fisher. 3- It's Beginning to Look Like Christmas - Perry Como and The Fontaine Sisters. 4- I Saw Mommy Kissing Santa Claus - Spike Jones and His City Slickers/George Rock, vocal. 2- I Wish it Could Be Christmas Forever - Perry Como. 3- Medley: Deck the Halls/ Joy to the World/ It Came Upon the Midnight Clear - Kate Smith. 4- Away in a Manger - Ed Ames. 2- An Old Christmas Card - Jim Reeves. 3 - Christmas Is - The Fireside Singers. 5- Jingle Bells - The Singing Dogs. 7- Feliz Navidad - José Feliciano. 4- Winter Wonderland - Perry Como. Teen Trio with Gordon Goodman and Jack Best, Soloists. 3- Jingle Bells - Glenn Miller and His Orchestra. 4- (All I Want for Christmas Is) My Two Front Teeth - Spike Jones and His City Slickers. 5- The Merry Christmas Polka - Freddy Martin and His Orchestra. LP #5, side A "Beloved Carols"
1 - Here We Come A-Caroling (The Wassail Song). 2 - What Child is This? 3 -Angels fom the Realms of Glory. 5 - I Saw Three Ships. 6 -The Holly and the Ivy. LP #5, side B "Beloved Carols"
1 - Hark! the Herald Angels Sing. 2 -We Three Kings of Orient Are. 3 -The Twelve Days of Christmas. 4- God Rest Ye Merry, Gentlemen. 5-Angels We Have Heard on High. The Royal Philharmonic Orchestra and Chorus / Peter Knight, Conductor. Notes. 1- Courtesy of MCA Records, Inc. 2- Courtesy of Capitol Records, Inc. 3- Courtesy of Monument Record Corp.
*- Electronically re-recorded to simulate stereo.